§ 200-1 Scope and purpose. § 200-2 Requirements for site development stormwater plan. § 200-3 Methodologies for calculation of stormwater runoff rate and volume, stormwater runoff quality, and Groundwater Recharge. § 200-4 Stormwater management performance standards for major development. § 200-5 Design, construction and safety standards for structural stormwater management measures. § 200-6 Inspection, maintenance and repair of stormwater management measures. § 200-8 Violations and penalties. § 200-11 Additional sources for technical guidance. Land development projects and associated disturbance of vegetation and soil and changes in land cover, including increases in impervious cover, alter the hydrologic response of local watersheds and increase stormwater runoff rates and volumes. If inadequately or improperly managed, this stormwater runoff can deplete groundwater resources and increase flooding, stream channel erosion, and sediment transport and deposition. This stormwater runoff contributes to increased quantities of waterborne pollutants. Increases of stormwater runoff, soil erosion and nonpoint source pollutants have occurred in the past as a result of land development, and contribute to the degradation of the water resources of Mullica Township and downstream municipalities. Certain lands of Mullica Township lie within the Pinelands Area, and, therefore, development in this portion of Mullica Township is subject to the requirements of the Pinelands Protection Act (N.J.S.A. 13:18A-1 et seq.) and the implementing regulations and minimum standards contained in the Pinelands Comprehensive Management Plan (N.J.A.C. 7:50-1.1 et seq.) (CMP). The purpose and intent of these regulations and standards is to promote orderly development of the Pinelands so as to preserve and protect the significant and unique natural, ecological, agricultural, archaeological, historical, scenic, cultural and recreational resources of the Pinelands. Pinelands Area resources are to be protected in accordance with the Pinelands Comprehensive Management Plan at N.J.A.C. 7:50 et seq., New Jersey's Stormwater Management Rules at N.J.A.C. 7:8-1.1 et seq., and New Jersey's surface water quality antidegradation policies contained in the New Jersey Surface Water Quality Standards at N.J.A.C. 7:9B-1.1 et seq. Permitted uses shall maintain the ecological character and quality of the Pinelands, including good water quality and natural rates and volumes of flow. Increased stormwater rates and volumes and the sediments and pollutants associated with stormwater runoff from future development projects within the Pinelands Area have the potential to adversely affect Mullica Township's streams and water resources and the streams and water resources of downstream municipalities. It is in the public interest to regulate the discharge of stormwater runoff from "major development" projects, as defined in § 200-7 of this chapter, conducted within the Pinelands Area, as provided in this chapter, in order to control and minimize increases in stormwater runoff rates and volumes, to maintain groundwater recharge, and to control and minimize soil erosion, stream channel erosion and nonpoint source pollution associated with stormwater runoff. Therefore, it is the purpose of this chapter to establish minimum stormwater management requirements and controls for major development, consistent with the statewide stormwater requirements at N.J.A.C. 7:8, the regulations and standards contained in the Pinelands CMP, and the provisions of the adopted Master Plan and land use ordinances of Mullica Township. To protect public safety through the proper design and operation of stormwater management basins. Implementation of multiple stormwater management best management practices (BMPs) may be necessary to achieve the performance standards for stormwater runoff quantity and rate, groundwater recharge, erosion control, and stormwater runoff quality established through this chapter. Compliance with the stormwater runoff quantity and rate, groundwater recharge, erosion control, and stormwater runoff quality standards established through N.J.A.C. 7:8-1.1 et seq., and this chapter, shall be accomplished to the maximum extent practicable through the use of nonstructural BMPs before relying on structural BMPs. Nonstructural BMPs are also known as low impact development (LID) techniques. Nonstructural BMPs shall include both environmentally sensitive site design and source controls that prevent pollutants from being placed on the site or from being exposed to stormwater. Source control plans shall be developed based upon physical site conditions and the origin, nature and the anticipated quantity or amount of potential pollutants. Structural BMPs, where necessary, shall be integrated with nonstructural stormwater management strategies and proper maintenance plans. When using structural BMPs, multiple stormwater management measures, smaller in size and distributed spatially throughout the land development site, shall be used wherever possible to achieve the performance standards for water quality, quantity and groundwater recharge established through this chapter before relying on a single, larger stormwater management measure to achieve these performance standards. Procedures. In addition to other development review procedures set forth in the Code of Mullica Township, major developments located within the Pinelands Area shall comply with the stormwater management requirements and specifications set forth in this chapter. New agricultural development that meets the definition of major development in § 200-7 of this chapter shall be submitted to the appropriate soil conservation district for review and approval in accordance with the requirements of N.J.A.C. 5.4(b) 7:8. Development approvals issued for subdivisions and site plans pursuant to this chapter are to be considered an integral part of development approvals under the subdivision and site plan review process and do not relieve the applicant of the responsibility to secure required permits or approvals for activities regulated by any other applicable ordinance, code, rule, regulation, statute, act or other provision of law. In their interpretation and application, the provisions of this chapter shall be held to be the minimum requirements for the promotion of the public health, safety, and general welfare. This chapter is not intended to interfere with, abrogate, or annul any other ordinance, rule or regulation, statute, or other provision of law except that, where any provision of this chapter imposes restrictions different from those imposed by any other ordinance, rule or regulation, or other provision of law, the more restrictive or stringent provisions or higher standards shall control. Whenever an applicant seeks municipal approval of a site development that is subject to this chapter, the applicant shall submit all of the required components of the checklist for the site development stormwater plan at Subsection C below as part of the applicant's application for subdivision or site plan approval. These required components are in addition to any other information required under any provisions of Mullica Township's Land Use Ordinance or by the Pinelands Commission pursuant to N.J.A.C. 7:50-1.1 et seq. The applicant shall demonstrate that the site development project meets the standards set forth in this chapter. The applicant shall submit three copies of the materials listed in the checklist for site development stormwater plans in accordance with § 200-2C of this chapter. Site development stormwater plan approval. The applicant's site development stormwater plan shall be reviewed as a part of the subdivision or site plan review process by the municipal board or official from which municipal approval is sought. That municipal board or official shall consult the engineer retained by the Planning and/or Zoning Board (as appropriate) to determine if all of the checklist requirements have been satisfied and to determine if the project meets the standards set forth in this chapter. Topographic base map. The applicant shall submit a topographic base map of the site which extends a minimum of 300 feet beyond the limits of the proposed development, at a scale of one inch equals 200 feet or greater, showing one-foot contour intervals. The map shall indicate the following: existing surface water drainage, shorelines, steep slopes, soils, highly erodible soils, perennial or intermittent streams that drain into or upstream of any Category One or Pinelands Waters, wetlands and floodplains along with their appropriate buffer strips, marshlands and other wetlands, pervious or vegetative surfaces, existing surface and subsurface human-made structures, roads, bearing and distances of property lines, and significant natural and man-made features not otherwise shown. Mullica Township or the Pinelands Commission may require upstream tributary drainage system information as necessary. Detailed soil and other environmental conditions on the portion of the site proposed for installation of any stormwater BMPs, including, at a minimum: soils report based on on-site soil tests; locations and spot elevations in plan view of test pits and permeability tests; permeability test data and calculations; any other required soil data (e.g., mounding analyses results) correlated with location and elevation of each test site; cross-section of proposed stormwater BMP with side-by-side depiction of soil profile drawn to scale and seasonal high water table elevation identified; and any other information necessary to demonstrate the suitability of the specific proposed structural and nonstructural stormwater management measures relative to the environmental conditions on the portion(s) of the site proposed for implementation of those measures. Project description and site plan(s). The applicant shall submit a map (or maps) at the scale of the topographical base map indicating the location of existing and proposed buildings, roads, parking areas, utilities, structural facilities for stormwater management and sediment control, and other permanent structures. The map(s) shall also clearly show areas where alterations will occur in the natural terrain and cover, including lawns and other landscaping, and seasonal high groundwater elevations. A written description of the site plan and justification for proposed changes in natural conditions shall also be provided. Land use planning and source control plan. The applicant shall submit a detailed land use planning and source control plan which provides a description of how the site will be developed to meet the erosion control, groundwater recharge and stormwater runoff quantity and quality standards at § 200-4 through use of nonstructural or low-impact development techniques and source controls to the maximum extent practicable before relying on structural BMPs. The land use planning and source control plan shall include a detailed narrative and associated illustrative maps and/or plans that specifically address how each of the following nine nonstructural strategies identified in Subchapter 5 of the NJDEP Stormwater Management Rules (N.J.A.C. 7:8-5) and set forth below (Subsection C(4)(a) through ) will be implemented to the maximum extent practicable to meet the standards at § 200-4 of this chapter on the site. If one or more of the nine nonstructural strategies will not be implemented on the site, the applicant shall provide a detailed rationale establishing a basis for the contention that use of the strategy is not practicable on the site. Applying fertilizer in accordance with the requirements established under the Soil Erosion and Sediment Control Act, N.J.S.A. 4:24-39 et seq., and implementing rules, when establishing vegetation after land disturbance. For sites where stormwater will be generated from "high pollutant loading areas" or where stormwater will be exposed to "source material," as defined in § 200-7 of this chapter, the applicant shall also demonstrate in the land use planning and source control plan that the requirements of § 200-4 have been met. The use of nonstructural strategies to meet the performance standards in § 200-4 of this chapter is not required for development sites creating less than one acre of disturbance. However, each application for major development and any other application where Mullica Township otherwise requires a landscaping plan shall contain a landscaping or revegetation plan in accordance with the CMP standards at N.J.A.C. 7:50-6.24(c). In addition, the applicant shall demonstrate that, at a minimum, existing trees and vegetation on the development site will be preserved and protected according to the minimum standards established by provisions of the Mullica Township Land Use Ordinance, Zoning Ordinance or by conditions of zoning or variance approval. Details of all stormwater management facility designs, during and after construction, including discharge provisions, discharge capacity for each outlet at different levels of detention (if applicable) and emergency spillway provisions with maximum discharge capacity of each spillway. Calculations (groundwater recharge and stormwater runoff rate, volume and quality). The applicant shall submit comprehensive hydrologic and hydraulic design calculations for the predevelopment and postdevelopment conditions for the design storms specified in § 200-3. The standards for groundwater recharge and stormwater runoff rate, volume and quality required by § 200-4 shall be met using the methods, calculations and assumptions provided in § 200-3. Copies of the inspection and maintenance reporting sheets. Exception from submission requirements. An exception may be granted from submission of any of these required components (except Subsection C(7), above, Inspection, maintenance and repair plan) if its absence will not materially affect the review process. However, items required pursuant to the application requirements in the Mullica Township Land Development Ordinance (Article 9, 144-68.3) shall be submitted to the New Jersey Pinelands Commission unless the Executive Director waives or modifies the application requirements. Method of calculating stormwater runoff rate and volume. In complying with the stormwater runoff quantity and rate standards in § 200-4B, the design engineer shall calculate the stormwater runoff rate and volume using the USDA Natural Resources Conservation Service (NRCS) Runoff Equation, Runoff Curve Numbers, and Dimensionless Unit Hydrograph, as described in the NRCS National Engineering Handbook Part 630 — Hydrology and Technical Release 55 — Urban Hydrology for Small Watersheds, as amended and supplemented. Alternative methods of calculation may be utilized, provided such alternative methods are at least as protective as the NRCS methodology when considered on a regional stormwater management basis. Calculation of stormwater runoff from unconnected impervious surfaces shall be based, as applicable, upon the two-step method described in the current New Jersey Stormwater Best Management Practices Manual or the NRCS methodology. In calculating stormwater runoff using the NRCS methodology, the design engineer shall use appropriate twenty-four-hour rainfall depths as developed for the project site by the National Oceanic and Atmospheric Administration, available online at http://hdsc.nws.noaa.gov/hdsc/pfds/index.html. The design engineer can document the character and extent of such land cover through the use of photographs, affidavits, and/or other acceptable land use records. If more than one land cover has existed on the site during the five years immediately prior to the time of application, the land cover with the lowest runoff potential shall be used for the computations. All predeveloped land covers shall be assumed to be in good hydrologic condition and, if cultivated, shall be assumed to have conservation treatment. In calculating predeveloped site stormwater runoff, the design engineer shall include the effects of all land features and structures, such as ponds, wetlands, depressions, hedgerows and culverts, that affect predeveloped site stormwater runoff rates and/or volumes. Method of calculating stormwater runoff quality. In complying with the stormwater runoff quality standards in § 200-4F(1), the design engineer shall calculate the stormwater runoff rate and volume using the USDA Natural Resources Conservation Service (NRCS) Runoff Equation, Runoff Curve Numbers, and Dimensionless Unit Hydrograph, as described in the NRCS National Engineering Handbook Part 630 — Hydrology and Technical Release 55 — Urban Hydrology for Small Watersheds, as amended and supplemented. The design engineer shall also use the NJDEP Water Quality Design Storm, which is 1.25 inches of rainfall falling in a nonlinear pattern in two hours. Details of the water quality design storm are shown in Table 1. Calculation of runoff volumes, peak rates, and hydrographs for the water quality design storm may take into account the implementation of nonstructural and structural stormwater management measures. Total suspended solids (TSS) reduction calculations. the TSS percent removal rate applicable to the second BMP. TSS removal rates for stormwater BMPs. For purposes of TSS reduction calculations, Table 2 presents the presumed removal rates for certain BMPs designed in accordance with the New Jersey BMP Manual. The BMP Manual may be obtained from the address identified in § 200-11A or found on the NJDEP's website at www.njstormwater.org. TSS reduction shall be calculated based on the removal rates for the BMPs in Table 2. The New Jersey Pinelands Commission, PO Box 7, New Lisbon, New Jersey 08064. Pollutant removal rates as certified by NJDEP; see § 200-3. NOTE: Source: N.J.A.C. 7:8-5.5(c) and New Jersey BMP Manual Chapter 4. Nutrient removal rates for stormwater BMPs. For purposes of postdevelopment nutrient load reduction calculations, Table 2 presents the presumed removal rates for certain BMPs designed in accordance with the New Jersey BMP Manual. If alternative stormwater BMPs are proposed, the applicant shall demonstrate that the selected BMPs will achieve the nutrient removal standard required in § 200-4F. Methods of calculating groundwater recharge. In complying with the groundwater recharge requirements in § 200-4C(1)(a), the design engineer may calculate groundwater recharge in accordance with the New Jersey Groundwater Recharge Spreadsheet (NJGRS) computer program incorporated herein by reference, as amended and supplemented. Information regarding the methodology is available in § 200-10A or from the New Jersey BMP Manual. Alternative groundwater recharge calculation methods to meet these requirements may be used upon approval by the Municipal Engineer. Use appropriate two-year, twenty-four-hour rainfall depths as developed for the project site by the National Oceanic and Atmospheric Administration, available online at http://hdsc.nws.noaa.gov/hdsc/pfds/index.html. If more than one land cover, other than woods, has existed on the site during the five years immediately prior to the time of application, the land cover with the lowest runoff potential (including woods) shall be used for the computations. To the maximum extent practicable, the performance standards in § 200-4 for major development shall be met by incorporating the nine nonstructural strategies identified in Subchapter 5 of the New Jersey Stormwater Management Rules (N.J.A.C. 7:8-5), and set forth in § 200-2C(4)(a), into the design. The applicant shall identify within the land use planning and source control plan required by § 200-2C(4) of this chapter how each of the nine nonstructural measures will be incorporated into the design of the project to the maximum extent practicable. The land use planning and source control plan is amended to provide an adequate rationale for the contention that use of the particular strategy is not practical on the site, and the amended plan is approved by Mullica Township. In addition to all other requirements of this section, each applicant shall demonstrate that, at a minimum, existing trees and vegetation on the development site will be preserved, protected and maintained according to the minimum standards established by provisions of the Mullica Township Land Use Ordinance, Zoning Ordinance or by conditions of zoning or variance approval. Existing trees and vegetation shall be protected during construction activities in accordance with the Standard for Tree Protection During Construction provided in the New Jersey State Soil Conservation Committee Standards for Soil Erosion and Sediment Control in New Jersey, which is incorporated herein by reference, as amended and supplemented. In addition to all other requirements of this section, each application for major development, and any other application where Mullica Township otherwise requires a landscaping plan, shall contain a landscaping or revegetation plan in accordance with the Pinelands CMP standards at N.J.A.C. 7:50-6.24(c). Any land area used as a nonstructural stormwater management measure to meet the performance standards in § 200-4 shall be dedicated to a government entity; shall be subjected to a conservation easement filed with the appropriate county clerk's office; or shall be subjected to an equivalent form of restriction approved by Mullica Township that ensures that that measure, or equivalent stormwater management measure, is maintained in perpetuity, as detailed in § 200-6 of this chapter. Guidance for nonstructural stormwater management strategies is available in the New Jersey BMP Manual, which may be obtained from the address identified in § 200-11A or found on the NJDEP's website at www.njstormwater.org. Existing trees and vegetation shall be protected during construction activities in accordance with the Standard for Tree Protection During Construction provided in the New Jersey State Soil Conservation Committee Standards for Soil Erosion and Sediment Control in New Jersey, which is incorporated herein by reference, as amended and supplemented. Stormwater runoff quantity and rate standards. There shall be no direct discharge of stormwater runoff from any point or nonpoint source to any wetland, wetlands transition area or surface waterbody. In addition, stormwater runoff shall not be directed in such a way as to increase the volume and/or rate of discharge into any surface water body from that which existed prior to development of the site. To the maximum extent practical, there shall be no direct discharge of stormwater runoff onto farm fields so as to protect farm crops from damage due to flooding, erosion and long-term saturation of cultivated crops and cropland. For all major developments, the total runoff volume generated from the net increase in impervious surfaces by a ten-year, twenty-four-hour storm shall be retained and infiltrated on site. Would be subject to review under these standards if they are proposed for any degree of development in the future. In tidal flood hazard areas, a stormwater runoff quantity analysis in accordance with Subsection B(4)(a),(b) and (c) above shall only be applied if the increased volume of stormwater runoff could increase flood damages below the point of discharge. The standards for stormwater runoff quantity and rate required by this section shall be met using the methods, calculations and assumptions provided in § 200-3. Demonstrate, through hydrologic and hydraulic analysis, that any increase in the project site's stormwater runoff volume for the two-year, twenty-four-hour storm from predeveloped to postdeveloped conditions is infiltrated on site. The design engineer shall assess the hydraulic impact on the groundwater table and design the project site and all site groundwater recharge measures so as to avoid adverse hydraulic impacts. Adverse hydraulic impacts include, but are not limited to: raising the groundwater table so as to cause surface ponding; flooding of basements and other subsurface structures and areas; preventing a stormwater infiltration basin from completely draining via infiltration within 72 hours of a design storm event; and interference with the proper operation of subsurface sewage disposal systems and other surface and subsurface facilities in the vicinity of the groundwater recharge measure. The standards for groundwater recharge required by this section shall be met using the methods, calculations and assumptions provided in § 200-3. The preceding groundwater recharge standards shall not apply to sites that create less than one acre of disturbance. Erosion control standards. The minimum design and performance standards for erosion control are those established under the Soil Erosion and Sediment Control Act, N.J.S.A. 4:24-39 et seq., and its implementing regulations, N.J.A.C. 2:90-1.1 through 1.4. There shall be no direct discharge of stormwater runoff from any point or nonpoint source to any wetland, wetland transition area or surface waterbody. Stormwater management measures shall be designed to reduce the total suspended solids (TSS) load in the stormwater runoff from the postdeveloped site by 80%, expressed as an annual average. Stormwater management measures shall also be designed to reduce the nutrient load in the stormwater runoff from the postdeveloped site by the maximum extent practicable. In achieving this reduction, the design of the development site shall include nonstructural and structural stormwater management measures that optimize nutrient removal while still achieving the groundwater recharge, runoff quantity and rate, and TSS removal standards in this section. The standards for stormwater runoff quality required by this section shall be met using the methods, calculations, assumptions and pollutant removal rates provided in § 200-3. Major residential development sites that create less than one acre of disturbance. The TSS reduction requirement in § 200-4F(2) shall not apply to any stormwater runoff in a discharge regulated under a numeric effluent limitation for TSS imposed under the NJPDES rules (N.J.A.C. 7:14A) or in a discharge specifically exempt under a NJPDES permit from this requirement. The stormwater runoff quantity and rate standards in § 200-4B shall still be met for all major development sites. Additional stormwater quality standards for high pollutant loading areas and areas where stormwater runoff is exposed to source material. Areas where stormwater is exposed to source material. Media filtration system manufactured treatment device with a minimum eighty-percent TSS removal as verified by the New Jersey Corporation for Advanced Technology and as certified by NJDEP. If the potential for contamination of stormwater runoff by petroleum products exists onsite, prior to being conveyed to the pretreatment BMP required in § 200-4D(2)(d) above, the stormwater runoff from the areas described in Subsection F(1) and (2) above shall be conveyed through an oil/grease separator or other equivalent manufactured filtering device to remove the petroleum hydrocarbons. The applicant shall provide the reviewing agency with sufficient data to demonstrate acceptable performance of the device. Threatened and endangered species and associated habitat standards. Stormwater management measures shall address the impacts of the development on habitat for threatened and endangered species, in accordance with N.J.A.C. 7:8-5.2(c), N.J.A.C. 7:50-6.27, and 7:50-6.33 and 34. Mullica Township has an adopted and effective municipal stormwater management plan in accordance with N.J.A.C. 7:8-4.4, which includes a mitigation plan in accordance with N.J.A.C. 7:8-4.2(c)11, and is also certified by the Pinelands Commission. The mitigation plan shall identify what measures are necessary to offset the deficit created by granting the exception and the Mullica Township shall submit a written report to the county review agency and the NJDEP describing the exception and the required mitigation. Guidance for developing municipal stormwater management plans, including mitigation plans, is available from the NJDEP, Division of Watershed Management and the New Jersey BMP Manual. The in lieu contribution shall be used to fund an off-site stormwater control mitigation project(s) located within the Pinelands Area, within the same drainage area as the development site, and shall meet or exceed the equivalent recharge, quality or quantity performance standards which are lacking on the development site. Such mitigation project shall be identified by Mullica Township in Mullica Township's adopted municipal stormwater management plan. The Stormwater control project to which the monetary contribution will be applied shall be identified by Mullica Township at the time the exception is granted. The applicant shall amend the project description and site plan required in § 200-2C(3) to incorporate a description of both the standards for which an on-site exception is being granted and of the selected off-site mitigation project. Mullica Township shall expend the in lieu contribution to implement the selected off-site mitigation project within five years from the date that payment is received. Should Mullica Township fail to expend the in lieu contribution within the required timeframe, the mitigation option provided in § 200-4H(1)(c) of this chapter shall be void and Mullica Township shall be prohibited from collecting in lieu contributions. An exception from strict compliance granted in accordance with Subsection H(1) above shall not constitute a waiver of strict compliance from the requirements of the Pinelands Comprehensive Management Plan at N.J.A.C. 7:50. An applicant should contact the Pinelands Commission to determine whether a waiver of strict compliance is also required in accordance with N.J.A.C. 7:50, Subchapter 4, Part V.
General design and construction standards. The following structural stormwater management measures may be utilized as part of a stormwater management system at a major land development in the Pinelands, provided that the applicant demonstrates that they are designed, constructed and maintained so as to meet the standards and requirements established by this chapter. If alternative stormwater management measures are proposed, the applicant shall demonstrate that the selected measures will achieve the standards established by this chapter. Manufactured treatment devices, provided their pollutant removal rates are verified by the New Jersey Corporation for Advanced Technology and certified by the NJDEP. Structural stormwater management measures shall be designed to take into account the existing site conditions, including environmentally critical areas, wetlands, flood-prone areas, slopes, depth to seasonal high water table, soil type, permeability and texture, and drainage area and drainage patterns. Structural stormwater management measures shall be designed and constructed to be strong, durable, and corrosion resistant (Measures that are consistent with the relevant portions of the Residential Site Improvement Standards at N.J.A.C. 5:21-7.3, 7.4, and 7.8 shall be deemed to meet this requirement. ); to minimize and facilitate maintenance and repairs; and to ensure proper functioning. For all stormwater management measures at a development site, each applicant shall submit a detailed inspection, maintenance and repair plan consistent with the requirements of § 200-5 of this chapter. Incorporates pretreatment measures. Pretreatment can extend the functional life and increase the pollutant removal capability of a structural stormwater management measure. Pretreatment measures may be designed in accordance with the New Jersey BMP Manual or other sources approved by the Municipal Engineer. Establishment of attractive landscaping in and around the basin that mimics the existing vegetation and incorporates native Pinelands plants, including, but not limited to, the species listed in N.J.A.C. 7:50-6.25 and 6.26. Stormwater management basins shall be designed with gently sloping sides. The maximum allowable basin side slope shall be three horizontal to one vertical (3:1). Guidance on the design and construction of structural stormwater management measures may be found in the New Jersey BMP Manual. Other guidance sources may also be used upon approval by the Municipal Engineer. After all construction activities and required field testing have been completed on the development site, as-built plans depicting design and as-built elevations of all stormwater management measures shall be prepared by a licensed land surveyor and submitted to the Municipal Engineer. Based upon the Municipal Engineer's review of the as-built plans, all corrections or remedial actions deemed by the Municipal Engineer to be necessary due to the failure to comply with the standards established by this chapter and/or any reasons of public health or safety shall be completed by the applicant. In lieu of review by the Municipal Engineer, Mullica Township reserves the right to engage a professional engineer to review the as-built plans. The applicant shall pay all costs associated with such review. Design and construction standards for stormwater infiltration BMPs. Stormwater infiltration BMPs, such as bioretention systems with infiltration, dry wells, infiltration basins, pervious paving systems with storage beds, and sand filters with infiltration shall be designed, constructed and maintained to completely drain the total runoff volume generated by the basin's maximum design storm within 72 hours after a storm event. Runoff storage for greater times can render the BMP ineffective and may result in anaerobic conditions, odor and both water quality and mosquito breeding problems. Stormwater infiltration BMPs shall be designed, constructed and maintained to provide a minimum separation of at least two feet between the elevation of the lowest point of the bottom of the infiltration BMP and the seasonal high water table. The bioretention system is integrated into and made part of the infiltration BMP and, as such, does not require an underdrain system. If this option is selected, the infiltration BMP shall be designed and constructed so that the maximum water depth in the bioretention system portion of the BMP during treatment of the stormwater quality design storm is 12 inches in accordance with the New Jersey BMP Manual. The minimum design permeability rate for the soil within a BMP that relies on infiltration shall be 0.5 inch per hour. A factor of safety of two shall be applied to the soil's field-tested permeability rate to determine the soil's design permeability rate. For example, if the field-tested permeability rate of the soil is four inches per hour, its design permeability rate would be two inches per hour. The minimum design permeability rate for the soil within a stormwater infiltration basin shall also be sufficient to achieve the minimum seventy-two-hour drain time described in Subsection B(1) above. The maximum design permeability shall be 10 inches per hour. The results of all field permeability tests shall be certified by a professional engineer and transmitted to the Municipal Engineer. To help ensure maintenance of the design permeability rate over time, a six-inch layer of K5 soil shall be placed on the bottom of a stormwater infiltration BMP. This soil layer shall meet the textural and permeability specifications of a K5 soil as provided at N.J.A.C. 7:9A, Appendix A, Figure 6, and be certified to meet these specifications by a professional engineer licensed in the State of New Jersey. The depth to the seasonal high water table shall be measured from the bottom of the K5 sand layer. The design engineer shall assess the hydraulic impact on the groundwater table and design the project site and all stormwater infiltration basins so as to avoid adverse hydraulic impacts. Adverse hydraulic impacts include, but are not limited to: raising the groundwater table so as to cause surface ponding; flooding of basements and other subsurface structures and areas; preventing a stormwater infiltration basin from completely draining via infiltration within 72 hours of a design storm event; and interference with the proper operation of subsurface sewage disposal systems and other surface and subsurface structures in the vicinity of the stormwater infiltration basin. 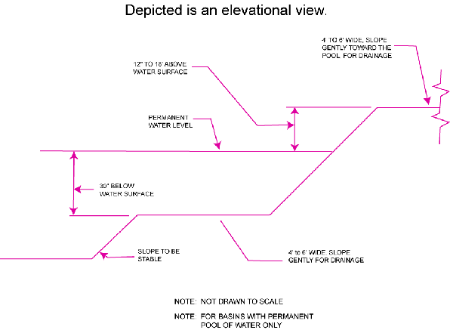 The design engineer shall conduct a mounding analysis, as defined in § 200-7, of all stormwater infiltration BMPs. The mounding analysis shall be conducted in accordance with the requirements in § 200-10C(3)(l). Where the mounding analysis identifies adverse impacts, the stormwater infiltration BMP shall be redesigned or relocated, as appropriate. Unless the conditions in Subsection B(9)(a) below are met, a stormwater infiltration basin shall not be placed into operation until its drainage area is completely stabilized. Instead, upstream runoff shall be diverted around the basin and into separate, temporary stormwater management facilities and sediment basins. Such temporary facilities and basins shall be installed and utilized for stormwater management and sediment control until stabilization is achieved in accordance with the Standards for Soil Erosion and Sediment Control in New Jersey, which is incorporated herein by reference as amended and supplemented. If the design engineer determines that, for engineering, environmental or safety reasons, temporary stormwater management facilities and sediment basins cannot be constructed on the site, the stormwater infiltration basin may be placed into operation prior to the complete stabilization of its drainage area, provided that the basin's bottom during this period is constructed at a depth at least two feet higher than its final design elevation. All other infiltration BMP construction requirements in this section shall be followed. When the drainage area is completely stabilized, all accumulated sediment shall be removed from the infiltration BMP, which shall then be excavated to its final design elevation in accordance with the construction requirements of this section and the performance standards in § 200-4. To avoid compaction of subgrade soils of BMPs that rely on infiltration, no heavy equipment such as backhoes, dump trucks or bulldozers shall be permitted to operate within the footprint of the BMP. All excavation required to construct a stormwater infiltration BMP shall be performed by equipment placed outside the BMP. If this is not possible, the soils within the excavated area shall be renovated and tilled after construction is completed to reverse the effects of compaction. In addition, postdevelopment soil permeability testing shall be performed in accordance with Subsection B(5) of this section. Earthwork associated with stormwater infiltration BMP construction, including excavation, grading, cutting or filling, shall not be performed when soil moisture content is above the lower plastic limit. Safety standards for structural stormwater management measures. If a structural stormwater management measure has an outlet structure, escape provisions shall be incorporated in or on the structure. Escape provisions mean the permanent installation of ladders, steps, rungs, or other features that provide readily accessible means of ingress and egress from the outlet structure. The trash rack should be constructed primarily of bars aligned in the direction of flow with one-inch spacing between the bars to the elevation of the water quality design storm. For elevations higher than the water quality design storm, the bars shall be spaced no greater than 1/3 the width of the hydraulic opening it is protecting or six inches, whichever is less. Transverse bars aligned perpendicular to flow should be sized and spaced as necessary for rack stability and strength. The maximum side slope for an earthen dam, embankment, or berm shall not be steeper than three horizontal to one vertical (3:1). Safety ledges shall be constructed on the slopes of all new structural stormwater management measures having a permanent pool of water deeper than 2 1/2 feet. Such safety ledges shall be comprised of two steps. Each step shall be four to six feet in width. One step shall be located approximately 2 1/2 feet below the permanent water surface, and the second step shall be located one to 1 1/2 feet above the permanent water surface. See Subsection C(5)(a) below for an illustration of safety ledges in a stormwater management basin. Source: N.J.A.C. 7:8-6 Appendix A.
Applicability. Projects subject to review pursuant to § 200-1C of this chapter shall comply with the requirements of § 200-6B and C below. General inspection, maintenance and repair plan. The design engineer shall prepare an inspection, maintenance and repair plan for the stormwater management measures, including both structural and nonstructural measures incorporated into the design of a major development. This plan shall be submitted as part of the checklist requirements established in § 200-2C. Inspection and maintenance guidelines for stormwater management measures are available in the New Jersey BMP Manual. The name, address and telephone number of the person or persons responsible for regular inspections and preventative and corrective maintenance (including repair and replacement). If the responsible person or persons is a corporation, company, partnership, firm, association, Mullica Township or political subdivision of this state, the name and telephone number of an appropriate contact person shall also be included. The person responsible for inspection, maintenance and repair identified under § 200-6B(2) above shall maintain a detailed log of all preventative and corrective maintenance performed for the site's stormwater management measures, including a record of all inspections and copies of all maintenance-related work orders in the inspection, maintenance and repair plan. Said records and inspection reports shall be retained for a minimum of five years. If the inspection, maintenance and repair plan identifies a person other than the developer (for example, a public agency or homeowners' association) as having the responsibility for inspection and maintenance, the plan shall include documentation of such person's agreement to assume this responsibility or of the developer's obligation to dedicate a stormwater management measure to such person under an applicable ordinance or regulation. If the person responsible for inspection, maintenance and repair identified under § 200-6B(2) above is not a public agency, the maintenance plan and any future revisions based on § 200-6B(6) below shall be recorded upon the deed of record for each property on which the maintenance described in the maintenance plan shall be undertaken. The person responsible for inspection, maintenance and repair identified under § 200-6B(2) above shall evaluate the effectiveness of the inspection, maintenance and repair plan at least once per year and update the plan and the deed as needed. The person responsible for inspection, maintenance and repair identified under § 200-6B(2) above shall submit the updated inspection, maintenance and repair plan and the documentation required by § 200-6B(2) and (3) above to Mullica Township once per year. The person responsible for inspection, maintenance and repair identified under § 200-6B(2) above shall retain and make available, upon request by any public entity with administrative, health, environmental or safety authority over the site, the inspection, maintenance and repair plan and the documentation required by § 200-6B(2) and (3) above. Responsibility for inspection, repair and maintenance shall not be assigned or transferred to the owner or tenant of an individual property in a residential development or project, unless such owner or tenant owns or leases the entire residential development or project. Preventative and corrective maintenance shall be performed to maintain the function of the stormwater management measure, including, but not limited to: repairs or replacement to any associated appurtenance of the measure; removal of sediment, debris, or trash; restoration of eroded areas; snow and ice removal; fence repair or replacement; restoration of vegetation; repair or replacement of linings; and restoration of infiltration function. Stormwater management measure easements shall be provided by the property owner as necessary for facility inspections and maintenance and preservation of stormwater runoff conveyance, infiltration, and detention areas and facilities. The purpose of the easement shall be specified in the maintenance agreement. In the event that the stormwater management measure becomes a public health nuisance or danger to public safety or public health, or if it is in need of maintenance or repair, Mullica Township shall so notify the responsible person in writing. Upon receipt of that notice, the responsible person shall have 14 days to effect maintenance and repair of the facility in a manner that is approved by the Municipal Engineer or the Municipal Engineer's designee. Mullica Township, at its discretion, may extend the time allowed for effecting maintenance and repair for good cause. If the responsible person fails or refuses to perform such maintenance and repair within the allowable time, Mullica Township may immediately proceed to do so with its own forces and equipment and/or through contractors. The costs and expenses of such maintenance and repair by Mullica Township shall be entered on the tax roll as a special charge against the property and collected with any other taxes levied thereon for the year in which the maintenance and repair was performed. After every storm exceeding one inch of rainfall, inspect and, if necessary, remove and replace K5 sand layer and accumulated sediment to restore original infiltration rate. Additional guidance for the inspection, maintenance and repair of stormwater infiltration BMPs can be found in the New Jersey BMP Manual. The assumption of the inspection and maintenance program by a municipality, county, public utility or homeowners' association. The required payment of fees to a municipal stormwater fund in an amount equivalent to the cost of both ongoing maintenance activities and necessary structural replacements. Other suitable method approved by the municipality. Editor's Note: See also Subsection I below. Establishment and maintenance of funds required for nonpublic ownerships. For all stormwater management measures to be inspected, maintained and repaired by homeowner associations, condominium associations or any other form of nonpublic ownership, the ownership entity shall establish and maintain a fund for the annual inspection and testing program, annual maintenance and repair program and annual contribution to a contingency fund for long-term reinspection, and/or any other stormwater maintenance, and/or inspection guarantees, and/or programs as required by its site plan approval or any other portion of the Stormwater Management Ordinance. The initial costs agreed to for the annual inspection and testing program and annual maintenance and repair program shall be based upon actual itemized proposals offered to the applicant by prospective vendors. The annual cost expended on inspection, testing and maintenance shall be reported to the Township of Mullica to verify that maintenance is not being deferred and to inform the Township of Mullica on the magnitude of those services. The contingency fund shall require sufficient funds to be committed for long-term reconstruction of the stormwater management measure(s). Major reconstruction activities will necessitate proper financial planning. After an agreed number of years, depending on the type of measure(s), the measure(s) will need to be reconstructed. The contingency fund in the financial schedule shall be based on the future value of the measure being reconstructed. Both inflation rates and bank interest rates shall be based on the ten-year average published in the Wall Street Journal or other approved publication. Interest accruing in the account must also be accounted for at an agreed-upon interest rate to arrive at an annual contribution amount. The ownership entity shall file with the Clerk of the Township of Mullica annually, on or before January 1, an accounting of the aforesaid contingency fund for the previous calendar year, the name and account number of the financial institution where the contingency fund is maintained, and a brief statement of the anticipated uses of the contingency fund for the next calendar year. The owner or ownership entity shall be responsible for all stormwater drainage facilities not officially dedicated and accepted by the Township. The Township shall notify the owner of the stormwater drainage facility of the existence of a maintenance problem when the Township has received a complaint and/or has been notified of a problem by its engineer. The Township Engineer is authorized to investigate any such complaint and to make any recommendations to remedy any conditions, including maintenance, which may be required to bring the property into compliance with the stormwater management requirements set forth in this section. If, after notification and a reasonable time, the owner fails to properly maintain the stormwater drainage facility, the Township may institute legal action to abate or enjoin the violation. The Township may also authorize its employees to enter the stormwater drainage facility to make it fully operative and compliant with the Stormwater Management Ordinance. The Township shall be reimbursed for such repairs by the ownership entity. In the event that reimbursement is not made within 60 days of notification to the ownership entity, then and in that event, any such costs shall become a lien on the property in favor of the Township of Mullica until such time as the Township is reimbursed. Unless specifically defined below, words or phrases used in this chapter shall be interpreted so as to give them the meaning they have in common usage and to give this chapter its' most reasonable application. When used in this chapter, the following terms shall have the meanings herein ascribed to them. The propagation, rearing and subsequent harvesting of aquatic organisms in controlled or selected environments, and their subsequent processing, packaging and marketing, including but not limited to activities to intervene in the rearing process to increase production such as stocking, feeding, transplanting and providing for protection from predators. Either a written statement signed and sealed by a licensed New Jersey professional engineer attesting that a BMP design or stormwater management system conforms to or meets a particular set of standards or to action taken by the Commission pursuant to N.J.A.C. 7:50-3, Part II or Part IV. Depending upon the context in which the term is used, the terms "certify" and "certified" shall be construed accordingly. The construction, erection, reconstruction, alteration, conversion, demolition, removal or equipping of buildings, structures or components of a stormwater management system, including but not limited to collection inlets, stormwater piping, swales and all other conveyance systems, and stormwater BMPs. The tested permeability rate with a factor of safety of two applied to it (e.g., if the tested permeability rate of the soils is four inches per hour, the design rate would be two inches per hour). Alteration, either physically or chemically, of a shore, bank, or floodplain, seacoast, river, stream, lake, pond, wetlands or artificial body of water. In the case of development on agricultural land, i.e., lands used for an agricultural use or purpose as defined at N.J.A.C. 7:50-2.11, development means: any activity that requires a state permit; any activity reviewed by the County Agricultural Boards (CAB) and the State Agricultural Development Committee (SADC), and municipal review of any activity not exempted by the Right to Farm Act, N.J.S.A. 4:1C-1 et seq. Any division of land into five or more lots; any construction or expansion of any housing development of five or more dwelling units; any construction or expansion of any commercial or industrial use or structure on a site of more than three acres; or any development, grading, clearing or disturbance of an area in excess of 5,000 square feet. Disturbance, for the purpose of this chapter, is the placement of impervious surface or exposure and/or movement of soil or bedrock or clearing, cutting or removing of vegetation. Excludes single-family dwellings. All development other than major development. A geographic area within which stormwater, sediments, or dissolved materials drain to a BMP, a stormwater management system, a particular receiving waterbody or a particular point along a receiving waterbody. An area or feature which is of significant environmental value, including but not limited to: stream corridors; natural heritage priority sites; habitat of endangered or threatened animal species; threatened or endangered plants of the Pinelands pursuant to N.J.A.C. 7:5-6.27(a); large areas of contiguous open space or upland forest; steep slopes; and wellhead protection and groundwater recharge areas. Threatened and endangered habitat constitutes habitat that is critical for the survival of a local population of threatened and endangered species or habitat that is identified using the Department's Landscape Project, as approved by the Department's Endangered and Nongame Species Program, whichever is more inclusive. Threatened and endangered wildlife shall be protected in conformance with N.J.A.C. 7:50-6.33. The approval by the approving authority of a variance or other material departure from strict compliance with any section, part, phrase or provision of this chapter. An exception may be granted only under certain specific, narrowly defined conditions described herein and does not constitute a waiver of strict compliance with any section, part, phrase or provision of the Pinelands Comprehensive Management Plan (N.J.A.C. 7:50-1.1 et seq.). A facility constructed through filling and/or excavation that provides temporary storage of stormwater runoff. It has an outlet structure that detains and attenuates runoff inflows and promotes the settlement of pollutants. An extended detention basin is normally designed as a multistage facility that provides runoff storage and attenuation for both stormwater quality and quantity management. The term "stormwater detention basin" shall have the same meaning as extended detention basin. The elevation of the surface of the ground after completion of final grading, either via cutting, filling or a combination thereof. Modification of a land slope by cutting and filling with the native soil or redistribution of the native soil which is present at the site. Water below the land surface in a zone of saturation. A test performed to demonstrate that the groundwater below a stormwater infiltration basin will not mound up, encroach on the unsaturated zone, break the surface of the ground at the infiltration area or downslope, and create an overland flow situation. Equipment, machinery, or vehicles that exert ground pressure in excess of eight pounds per square inch. An area in an industrial or commercial development site: where solvents and/or petroleum products are loaded/unloaded, stored, or applied; where pesticides are loaded/unloaded or stored; where hazardous materials are expected to be present in greater than “reportable quantities,” as defined by the United States Environmental Protection Agency (EPA) at 40 CFR 302.4; where recharge would be inconsistent with NJDEP-approved remedial action work plan or landfill closure plan; and/or where a high risk exists for spills of toxic materials, such as gas stations and vehicle maintenance facilities. The term "HPLA" shall have the same meaning as high pollutant loading area. The process by which precipitation enters the soil through its surface. A monetary fee collected by Mullica Township in lieu of requiring strict on-site compliance with the groundwater recharge, stormwater runoff quantity and/or stormwater runoff quality standards established in this chapter. To assemble, construct, put in place or connect components of a stormwater management system. Acts necessary to prevent, limit, remedy or compensate for conditions that may result from those cases where an applicant has demonstrated the inability or impracticality of strict compliance with the stormwater management requirements set forth in N.J.A.C. 7:8, in an adopted regional stormwater management plan, or in a local ordinance which is as protective as N.J.A.C. 7:8, and an exception from strict compliance is granted by Mullica Township and the Pinelands Commission. The Planning Board, Zoning Board of Adjustment or other board, agency or official of Mullica Township with authority to approve or disapprove subdivisions, site plans, construction permits, building permits or other applications for development approval. For the purposes of reviewing development applications and ensuring compliance with the requirements of this chapter, Mullica Township may designate the Municipal Engineer or other qualified designee to act on behalf of Mullica Township. Guidance developed by the New Jersey Department of Environmental Protection, in coordination with the New Jersey Department of Agriculture, the New Jersey Department of Community Affairs, the New Jersey Department of Transportation, Municipal Engineers, county engineers, consulting firms, contractors, and environmental organizations to address the standards in the New Jersey Stormwater Management Rules, N.J.A.C. 7:8. The BMP manual provides examples of ways to meet the standards contained in the rule. An applicant may demonstrate that other proposed management practices will also achieve the standards established in the rules. The manual, and notices regarding future versions of the manual, are available from the Division of Watershed Management, NJDEP, PO Box 418, Trenton, New Jersey 08625, and on the NJDEP's website, www.njstormwater.org. The term "New Jersey BMP Manual" shall have the same meaning as New Jersey Stormwater Best Management Practices Manual. The New Jersey Pollutant Discharge Elimination System as set forth in N.J.S.A. 58:10A-1 et seq., and in N.J.A.C. 7:14A. A permit issued by the NJDEP pursuant to the authority of the Water Pollution Control Act, N.J.S.A. 58:10A-1 et seq., and N.J.A.C. 7:14A, for a discharge of pollutants. Any activity, factor, or condition, other than a point source, that contributes or may contribute to water pollution. The term "NPS" shall have the same meaning as nonpoint source. A stormwater management measure, strategy or combination of strategies that reduces adverse stormwater runoff impacts through sound site planning and design. Nonstructural BMPs include such practices as minimizing site disturbance, preserving important site features, reducing and disconnecting impervious cover, flattening slopes, utilizing native vegetation, minimizing turf grass lawns, maintaining natural drainage features and characteristics and controlling stormwater runoff and pollutants closer to the source. The term "low-impact development technique" shall have the same meaning as nonstructural BMP. The rate at which water moves through a saturated unit area of soil or rock material at hydraulic gradient of one, determined as prescribed in N.J.A.C. 7:9A-6.2 (Tube Permeameter Test), N.J.A.C. 6.5 (Pit Bailing Test) or N.J.A.C. 6.6 (Piezometer Test). Alternative permeability test procedures may be accepted by the approving authority, provided the test procedure attains saturation of surrounding soils, accounts for hydraulic head effects on infiltration rates, provides a permeability rate with units expressed in inches per hour and is accompanied by a published source reference. Examples of suitable sources include hydrogeology, geotechnical, or engineering text and design manuals, proceedings of American Society for Testing and Materials (ASTM) symposia, or peer-review journals. Neither a Soil Permeability Class Rating Test, as described in N.J.A.C. 7:9A-6.3, nor a Percolation Test, as described in N.J.A.C. 7:9A-6.4, are acceptable tests for establishing permeability values for the purpose of complying with this chapter. Having a permeability of one inch per hour or faster. The terms "permeable soil," "permeable rock" and "permeable fill" shall be construed accordingly. Any individual, corporation, company, partnership, firm, association, Mullica Township or political subdivision of this state subject to municipal jurisdiction pursuant to the Municipal Land Use Law, N.J.S.A. 40:55D-1 et seq. The New Jersey Pinelands Comprehensive Management Plan (N.J.A.C. 7:50 1.1 et seq.). The Commission created pursuant to Section 5 of the Pinelands Protection Act, N.J.S.A. 13:18A-5. Any discernible, confined, and discrete conveyance, including, but not limited to, any pipe, ditch, channel, tunnel, conduit, well, discrete fissure, container, rolling stock, concentrated animal feeding operation, landfill leachate collection system, vessel, or other floating craft, from which pollutants are or may be discharged. This term does not include return flows from irrigated agriculture. Any dredged spoil, solid waste, incinerator residue, filter backwash, sewage, garbage, refuse, oil, grease, sewage sludge, munitions, chemical wastes, biological materials, medical wastes, radioactive substances [except those regulated under the Atomic Energy Act of 1954, as amended (42 U.S.C. 2011 et seq. )], thermal waste, wrecked or discarded equipment, rock, sand, suspended solids, cellar dirt, industrial, municipal, agricultural, and construction waste or runoff, or other residue discharged directly or indirectly to the land, groundwaters or surface waters of the state, or to a domestic treatment works. Pollutant includes both hazardous and nonhazardous pollutants. A person licensed to practice professional engineering in the State of New Jersey pursuant to N.J.S.A. 48:8-27 et seq. One of two or more soil samples or tests taken at the same location (within five feet of each other) and depth, within the same soil horizon or substratum. In the case of fill material, replicate tests are tests performed on subsamples of the same bulk sample packed to the same bulk density. A particle size category consisting of mineral particles which are between 0.05 and 2.0 millimeters in equivalent spherical diameter. Also, a soil textural class having 85% or more of sand and a content of silt and clay such that the percentage of silt plus 1.5 times the percentage of clay does not exceed 15, as shown in § 200-10C(1) (USDA Soil Textural Triangle). The upper limit of the shallowest zone of saturation which occurs in the soil, identified as prescribed in N.J.A.C. 7:9A-5.8. All unconsolidated mineral and organic material of any origin which is not a rock substratum, including sediments below the biologically active and/or weathered zones. Any material(s) or machinery, located at an industrial facility that is directly or indirectly related to process, manufacturing or other industrial activities, which could be a source of pollutants in any industrial stormwater discharge to groundwater. Source materials include, but are not limited to, raw materials; intermediate products; final products; waste materials; by-products; industrial machinery and fuels, and lubricants, solvents and detergents that are related to process, manufacturing, or other industrial activities that are exposed to stormwater. A basin or other facility constructed within permeable soils that provides temporary storage of stormwater runoff. An infiltration BMP does not normally have a structural outlet to discharge runoff from the stormwater quality design storm. Instead, outflow from an infiltration BMP is through the surrounding soil. The terms "infiltration measure" and "infiltration practice" shall have the same meaning as stormwater infiltration BMP. Any structural or nonstructural strategy, practice, technology, process, program, or other method intended to control or reduce stormwater runoff and associated pollutants, or to induce or control the infiltration or groundwater recharge of stormwater or to eliminate illicit or illegal nonstormwater discharges into stormwater conveyances. This includes, but is not limited to, structural and nonstructural stormwater best management practices described in the New Jersey BMP Manual and designed to meet the standards for stormwater control contained within this chapter. The terms "stormwater best management practice" and "stormwater BMP" shall have the same meaning as stormwater management measure. Water flow on the surface of the ground or in storm sewers resulting from precipitation. Unsaturated soil, above the seasonally high water table, which contains less than 50% by volume of coarse fragments and which has a tested permeability rate of between one and 20 inches per hour. Any waters of the state which are not groundwater. The time it takes for runoff to travel from the hydraulically most distant point of the drainage area to the point of interest within a watershed. The insoluble solid matter suspended in water and stormwater that is separable by laboratory filtration in accordance with the procedure contained in the "Standard Methods for the Examination of Water and Wastewater," prepared and published jointly by the American Public Health Association, American Water Works Association and the Water Pollution Control Federation. The term "TSS" shall have the same meaning as total suspended solids. The ocean and its estuaries, all springs, streams and bodies of surface and groundwater, whether natural or artificial, within the boundaries of New Jersey or subject to its jurisdiction. The upper surface of a zone of saturation. A bored, drilled or driven shaft, or a dug hole, which extends below the seasonally high water table and which has a depth which is greater than its largest surface dimension. Those lands which are inundated or saturated by water at a magnitude, duration and frequency sufficient to support the growth of hydrophytes. Wetlands include lands with poorly drained or very poorly drained soils as designated by the National Cooperative Soils Survey of the Soil Conservation Service of the United States Department of Agriculture. Wetlands include coastal wetlands and inland wetlands, including submerged lands. The "New Jersey Pinelands Commission Manual for Identifying and Delineating Pinelands Area Wetlands: A Pinelands Supplement to the Federal Manual for Identifying and Delineating Jurisdictional Wetlands," dated January 1991, as amended, may be utilized in delineating the extent of wetlands based on the definitions of wetlands and wetlands soils contained in this section, N.J.A.C. 7:50 2.11, 6.4 and 6.5. The term "wetland" shall have the same meaning as wetlands. A stormwater facility constructed through filling and/or excavation that provides both permanent and temporary storage of stormwater runoff. It has an outlet structure that creates a permanent pool and detains and attenuates runoff inflows and promotes the settling of pollutants. A stormwater retention basin can also be designed as a multistage facility that also provides extended detention for enhanced stormwater quality design storm treatment and runoff storage and attenuation for stormwater quantity management. The term "stormwater retention basin" shall have the same meaning as wet pond. A fine not to exceed $1,250 or imprisonment not to exceed 90 days. Each day that a violation shall continue shall constitute a separate violation. Nothing in this chapter shall be construed to limit the Township's right to institute and maintain a civil action, from seeking active injunctive relief, or to set aside or invalidate any conveyance made pursuant to a contract of sale. Approval by the county review agency. Methods for calculating groundwater recharge. The New Jersey Geological Survey Report GSR-32: A Method for Evaluating Groundwater Recharge Areas in New Jersey, available at http://www.njgeology.org/geodata/dgs99-2.htm. The New Jersey Groundwater Recharge Spreadsheet (NJGRS), available in the New Jersey BMP Manual, Chapter 6, at http://www.njstormwater.org/bmp_manual2.htm. Source: United States Department of Agriculture. Definitions. For the purposes of this section, the following terms shall have the meanings herein ascribed to them. The uppermost mineral horizon in a normal soil profile. The upper part of the A-horizon is characterized by maximum accumulation of finely divided, dark-colored organic residues known as humus, which are intimately mixed with the mineral particles of the soil. A zone of saturation which exists immediately below a hydraulically restrictive horizon, and which has an upper surface which is at a pressure greater than atmospheric, either seasonally or throughout the year. The relative purity or strength of a color, a quantity which decreases with increasing grayness. Chroma is one of the three variables of soil color as defined in the Munsell system of classification. A particle size category consisting of mineral particles which are smaller than 0.002 millimeters in equivalent spherical diameter. Also, a soil textural class having more than 40% clay, less than 45% sand, and less than 40% silt, as shown in § 200-10C(1) (USDA Soil Textural Triangle). A soil textural class having 27% to 40% clay and 20% to 45% sand, as shown in § 200-10C(1) (USDA Soil Textural Triangle). A rock fragment contained within the soil which is greater than two millimeters in equivalent spherical diameter or which is retained on a two-millimeter sieve. A report prepared by the United States Department of Agriculture, Natural Resources Conservation Service, which includes maps showing the distribution of soil mapping units throughout a particular county, together with narrative descriptions of the soil series shown and other information relating to the uses and properties of the various soil series. Control over and direction of work carried out by others with full knowledge of and responsibility for such work. The diameter of a sphere which has a volume equal to the volume of a particle. A horizon of limited thickness within the soil profile which provides inadequate removal of pollutants from stormwater due to a high coarse fragment content, excessively coarse texture and/or excessively rapid permeability. A substratum below the soil profile which extends beyond the depth of soil profile pits and borings and which provides inadequate removal of pollutants from stormwater due to a high coarse fragment content, excessively coarse texture and/or excessively rapid permeability. A type of soil material whose moist aggregated mass crushes only under very strong pressure; cannot be crushed between the thumb and forefinger and shall be broken apart bit by bit. A type of soil material whose moist aggregated mass crushes under moderate pressure between the thumb and forefinger but resistance is distinctly noticeable. A type of soil material whose dry aggregated mass is moderately resistant to pressure; can be broken in the hands without difficulty but is barely breakable between the thumb and forefinger. The dominant spectral color, one of the three variables of soil color defined within the Munsell system of classification. A horizon within the soil profile which slows or prevents the downward or lateral movement of water and which is underlain by permeable soil horizons or substrata. Any soil horizon which has a saturated permeability less than one inch per hour is hydraulically restrictive. A substratum below the soil profile which slows or prevents the downward or lateral movement of water and which extends beyond the depth of profile pits or borings or to a massive substratum. A substratum which has a saturated permeability less than one inch per hour is hydraulically restrictive. 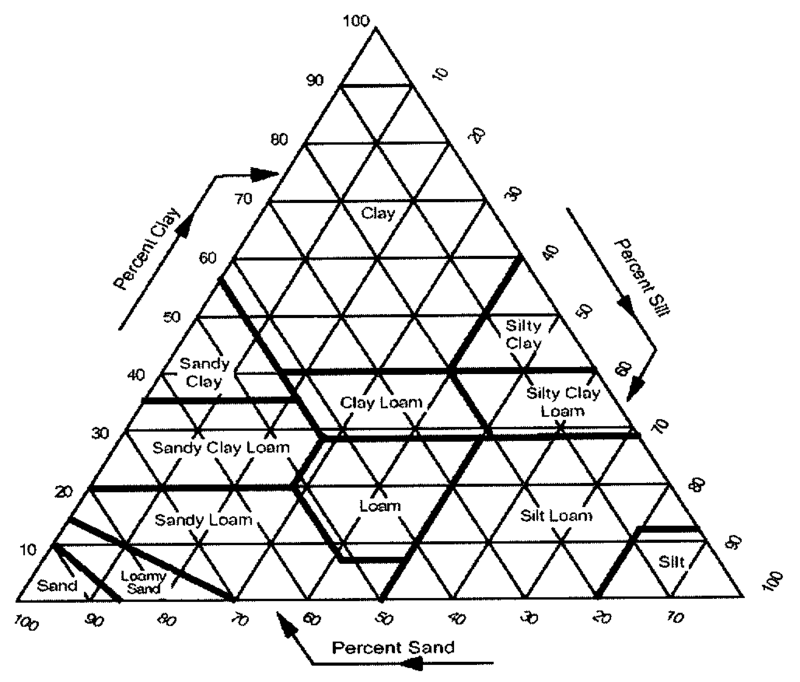 A soil textural class, as shown in § 200-10C(1) (USDA Soil Textural Triangle), that has a maximum of 85% to 90% sand with a percentage of silt plus 1.5 times the percentage of clay not in excess of 15, or a minimum of 70% to 85% sand with a percentage of silt plus 1.5 times the percentage of clay not in excess of 30. The moisture content corresponding to the transition between the plastic and semisolid states of soil consistency. This corresponds to the lowest soil moisture content at which the soil can be molded in the fingers to form a rod or wire, 1/8 inch in thickness, without crumbling. A color pattern observed in soil consisting of blotches or spots of contrasting color. The term "mottle" refers to an individual blotch or spot. The terms "color variegation," "iron depletion" and "iron concentration" are equivalent to the term "mottling." Mottling due to redoximorphic reactions is an indication of seasonal or periodic and recurrent saturation. A system of classifying soil color consisting of an alpha-numeric designation for hue, value and chroma, such as "7.5 YR 6/2," together with a descriptive color name, such as "strong brown." A surface horizon, occurring above the A-horizon in some soils, which is composed primarily of undecomposed or partially decomposed plant remains which have not been incorporated into the mineral soil. A zone of saturation which occurs immediately above a hydraulically restrictive horizon and which is underlain by permeable horizons or substrata which are not permanently or seasonally saturated. A device consisting of a length of metal or plastic pipe, open at the bottom or perforated within a specified interval, and used for the determination of depth to water, permeability or hydraulic head within a specific soil horizon or substratum. Characterized by a soil aggregate which has one axis distinctly shorter than the other two and are oriented with the short axis vertical. A zone of saturation which extends vertically without interruption below the depth of soil borings and profile pits. A soil textural class having 35% or more of clay and 45% or more of sand, as shown in § 200-10C(1) (USDA Soil Textural Triangle). 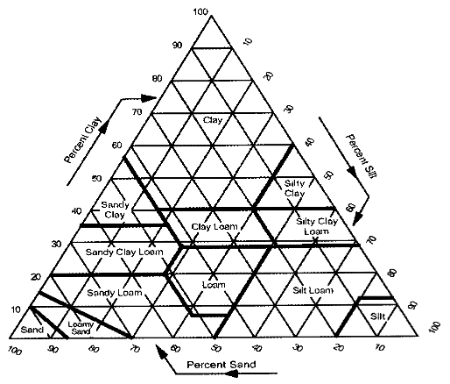 A soil textural class, as shown in § 200-10C(1) (USDA Soil Textural Triangle), that has a maximum of 20% clay, and the percentage of silt plus twice the percentage of clay exceeds 30, and contains 52% or more sand; or less than 7% clay, less than 50% silt, and between 43% and 52% sand. A particle size category consisting of mineral particles which are between 0.002 and 0.05 millimeters in equivalent spherical diameter. It also means a soil textural class having 80% or more of silt and 12% or less of clay, as shown in § 200-10C(1) (USDA Soil Textural Triangle). A soil textural class having 50% or more of silt and 12% to 27% of clay; or 50% to 80% of silt and less than 12% of clay, as shown in § 200-10C(1) (USDA Soil Textural Triangle). A soil textural class having 40% or more of clay and 40% or more of silt, as shown in § 200-10C(1) (USDA Soil Textural Triangle). A soil textural class having 27% to 40% of clay and less than 20% of sand, as shown in § 200-10C(1) (USDA Soil Textural Triangle). A naturally occurring unit of soil structure consisting of particles of sand, silt, clay, organic matter, and coarse fragments held together by the natural cohesion of the soil. The soil color name and Munsell color designation determined by comparison of the moist soil with color chips contained in a Munsell soil color book. The resistance of a soil aggregate or clod to being crushed between the fingers or broken by the hands. Terms for describing soil consistence are in N.J.A.C. 7:9A-5.3(h). A layer within a soil profile differing from layers of soil above and below it in one or more of the soil morphological characteristics, including color, texture, coarse fragment content, structure, consistence and mottling. A description of the soil profile which includes the depth, thickness, color, texture, coarse fragment content, mottling, structure and consistence of each soil horizon or substratum. An area outlined on a map in a county soil survey report and marked with a letter symbol designating a soil phase, a complex of two or more soil phases, or some other descriptive term where no soil type has been identified. A specific type of soil which is mapped by the Natural Resources Conservation Service and which belongs to a soil series described within the county soil survey report. A vertical cross section of undisturbed soil showing the characteristic horizontal layers or horizons of the soil which have formed as a result of the combined effects of parent material, topography, climate, biological activity and time. A grouping of soil types possessing a specific range of soil profile characteristics which are described within the county soil survey report. Each soil series may consist of several soil phases which may differ in slope, texture of the surface horizon or stoniness. One of the shape classes of soil structure described in N.J.A.C. 7:9A-5.3(g). The naturally occurring arrangement, within a soil horizon, of sand, silt and clay particles, coarse fragments and organic matter, which are held together in clusters or aggregates of similar shape and size. An excavation made for the purpose of exposing a soil profile which is to be described. One of the classes of soil texture defined within the USDA system of classification (Soil Survey Manual, Agricultural Handbook No. 18, USDA Soil Conservation Service, 1962). The relative proportions of sand, silt and clay in that portion of the soil which passes through a sieve with two-millimeter openings. The depth below the ground surface or the elevation with respect to some reference level of the water level observed within a soil profile pit or boring, or within a piezometer, after this level has stabilized or become relatively constant with the passage of time. A layer of soil or rock material present below the soil profile and extending beyond the depth of soil borings or profile pits. All soil other than suitable soil. The system of classifying soil texture used by the United States Department of Agriculture which defines 12 soil textural classes based upon the weight percentages of sand, silt and clay in that portion of the soil which passes through a sieve with two-millimeter openings. The soil textural classes are shown graphically on the USDA Soil Textural Triangle, as shown in § 200-10C(1). The relative lightness or intensity of a color, one of the three variables of soil color defined within the Munsell system of classification. Characterized by a moist soil which crushes under strong pressure; barely crushable between thumb and forefinger. Characterized by a dry soil which is resistant to pressure, can be broken in the hands only with difficulty; not breakable between the thumb and forefinger. A layer within or below the soil profile which is saturated with groundwater either seasonally or throughout the year. This includes both regional and perched zones. All soil test pits and soil permeability results shall be performed under the direct supervision of a professional engineer. All soil logs and permeability test data shall be accompanied by a certification by a professional engineer. The results and location (horizontal and vertical) of all soil test pits and soil permeability tests, both passing and failing, shall be reported to Mullica Township. During all subsurface investigations and soil test procedures, adequate safety measures shall be taken to prohibit unauthorized access to the excavations at all times. It is the responsibility of persons performing or witnessing subsurface investigations and soil permeability tests to comply with all applicable federal, state and local laws and regulations governing occupational safety. A minimum of two soil test pits shall be excavated within the footprint of any proposed infiltration BMP to determine the suitability and distribution of soil types present at the site. Placement of the test pits shall be within 20 feet of the basin perimeter, located along the longest axis bisecting the BMP. For BMPs larger than 10,000 square feet in area, a minimum of one additional soil test pit shall be conducted within each additional area of 10,000 square feet. The additional test pit(s) shall be placed approximately equidistant to other test pits, so as to provide adequate characterization of the subsurface material. In all cases where soil and/or groundwater properties vary significantly, additional test pits shall be excavated in order to accurately characterize the subsurface conditions below the proposed infiltration BMP. Soil test pits shall extend to a minimum depth of eight feet below the lowest elevation of the basin bottom or to a depth that is at least two times the maximum potential water depth in the proposed infiltration BMP, whichever is greater. A soil test pit log shall be prepared for each soil test pit. The test pit log shall, at a minimum, provide the elevation of the existing ground surface, the depth and thickness (in inches) of each soil horizon or substratum, the dominant matrix or background and mottle colors using the Munsell system of classification for hue, value and chroma, the appropriate textural class as shown on the USDA textural triangle, the volume percentage of coarse fragments (larger than two millimeters in diameter), the abundance, size, and contrast of mottles, the soil structure, soil consistence, and soil moisture condition, using standard USDA classification terminology for each of these soil properties. Soil test pit logs shall identify the presence of any soil horizon, substratum or other feature that exhibits an in-place permeability rate less than one inch per hour. Each soil test pit log shall report the depth to seasonally high water level, either perched or regional, and the static water level based upon the presence of soil mottles or other redoximorphic features, and observed seepage or saturation. Where redoxomorphic features, including soil mottles resulting from soil saturation, are present, they shall be interpreted to represent the depth to the seasonal high water table unless soil saturation or seepage is observed at a higher level. When the determination of the seasonally high water table shall be made in ground previously disturbed by excavation, direct observation of the static water table during the months of January through April shall be the only method permitted. Any soil horizon or substratum which exists immediately below a perched zone of saturation shall be deemed by rule to exhibit unacceptable permeability (less than one inch per hour). The perched zone of saturation may be observed directly, inferred based upon soil morphology, or confirmed by performance of a hydraulic head test as defined at N.J.A.C. 7:9A-5.9. Stormwater infiltration BMPs shall not be installed in soils that exhibit artesian groundwater conditions. A permeability test shall be conducted in all soils that immediately underlie a perched zone of saturation. Any zone of saturation which is present below a soil horizon which exhibits an in-place permeability of less than 0.2 inch per hour shall be considered an artesian zone of saturation unless a minimum one-foot-thick zone of unsaturated soil, free of mottling or other redoximorphic features and possessing a chroma of four or higher, exists immediately below the unsuitable soil. A minimum of one permeability test shall be performed at each soil test pit location. The soil permeability rate shall be determined using test methodology as prescribed in N.J.A.C. 7:9A-6.2 (Tube Permeameter Test), 6.5 (Pit Bailing Test) or 6.6 (Piezometer Test). When the tube permeameter test is used, a minimum of two replicate samples shall be taken and tested. Alternative permeability test procedures may be accepted by the approving authority, provided the test procedure attains saturation of surrounding soils, accounts for hydraulic head effects on infiltration rates, provides a permeability rate with units expressed in inches per hour and is accompanied by a published source reference. Examples of suitable sources include hydrogeology, geotechnical or engineering text and design manuals, proceedings of American Society for Testing and Materials (ASTM) symposia, or peer-review journals. Neither a Soil Permeability Class Rating Test, as described in N.J.A.C. 7:9A-6.3, nor a Percolation Test, as described in N.J.A.C. 7:9A-6.4, are acceptable tests for establishing permeability values for the purpose of complying with this chapter. Soil permeability tests shall be conducted on the most hydraulically restrictive horizon or substratum to be left in place below the basin as follows. Where no soil replacement is proposed, the permeability tests shall be conducted on the most hydraulically restrictive horizon or substratum within four feet of the lowest elevation of the basin bottom or to a depth equal to two times the maximum potential water depth within the basin, whichever is greater. Where soil replacement is proposed, the permeability tests shall be conducted within the soil immediately below the depth of proposed soil replacement or within the most hydraulically restrictive horizon or substratum to a depth equal to two times the maximum potential water depth within the basin, whichever is greater. Permeability tests may be performed on the most hydraulically restrictive soil horizons or substrata at depths greater than those identified above based upon the discretion of the design or testing engineer. The tested infiltration rate should then be divided by two to establish the soil's design permeability rate. Such division will provide a one-hundred-percent safety factor to the tested rate. The minimum acceptable tested permeability rate of any soil horizon or substratum shall be one inch per hour. Soil materials that exhibit tested permeability rates slower than one inch per hour shall be considered unsuitable for stormwater infiltration. The maximum reportable tested permeability rate of any soil horizon or substratum shall be no greater than 20 inches per hour regardless of the rate attained in the test procedure. After all construction activities have been completed on the development site and the finished grade has been established in the infiltration BMP, a minimum of one permeability test shall be conducted within the most hydraulically restrictive soil horizon or substratum below the as-built BMP to ensure the performance of the infiltration BMP is as designed. Hand tools and manual permeability test procedures shall be used for the purpose of confirming BMP performance. In addition, the infiltration BMP shall be flooded with water sufficient to demonstrate the performance of the BMP. Test results shall be certified to the Municipal Engineer. A groundwater mounding analysis shall be provided for each stormwater infiltration BMP. The groundwater mounding analysis shall calculate the maximum height of the groundwater mound based upon the volume of the maximum design storm. The professional engineer conducting the analysis shall provide the Municipal Engineer with the methodology and supporting documentation for the mounding analysis used and shall certify to Mullica Township, based upon the analysis, that the groundwater mound will not cause stormwater or groundwater to breakout to the land surface or cause adverse impact to adjacent surface water bodies, wetlands or subsurface structures, including but not limited to basements and septic systems. If there is more than one infiltration BMP proposed, the model shall indicate if and how the mounds will interact. The mounding analysis shall be calculated using the most restrictive soil horizon that will remain in place within the explored aquifer thickness unless alternative analyses is authorized by the Municipal Engineer. The mounding analysis shall be accompanied by a cross section of the infiltration BMP and surrounding topography and the mound analysis shall extend out to the point(s) at which the mound intersects with the preexisting maximum water table elevation. The applicant shall demonstrate that stormwater infiltration BMPs meet the seventy-two-hour drain time requirement established in § 200-5B(1) of this chapter. Bicycle-safe inlet grates. Site development plans that incorporate site design features that help to prevent discharge of trash and debris from drainage systems shall comply with the following standard to control passage of solid and floatable materials through storm drain inlets. For purposes of this subsection, "solid and floatable materials" means sediment, debris, trash, and other floating, suspended, or settleable solids. A different grate, if each individual clear space in that grate has an area of no more than seven square inches, or is no greater than 0.5 inch across the smallest dimension. Examples of grates subject to this standard include grates in grate inlets, the grate portion (non-curb-opening portion) of combination inlets, grates on storm sewer manholes, ditch grates, trench grates, and grates of spacer bars in slotted drains. Examples of ground surfaces include surfaces of roads (including bridges), driveways, parking areas, bikeways, plazas, sidewalks, lawns, fields, open channels, and stormwater basin floors. Where the NJDEP determines, pursuant to the New Jersey Register of Historic Places Rules at N.J.A.C. 7:4-7.2(c), that action to meet this standard is an undertaking that constitutes an encroachment or will damage or destroy the New-Jersey-Register-listed historic property. Catch basins. Catch basins are storm drain inlets with or without sumps. Catch basins may provide pretreatment for other stormwater BMPs by capturing large sediments. The sediment and pollutant removal efficiency of catch basins depends on the size of the sump and the performance of routine maintenance to retain the available sediment storage space in the sump. Where catch basins with sumps are proposed, the minimum two-foot separation between the bottom of the sump and seasonally high water table shall be provided. Open or perforated conveyance piping. Where adequate separation to the seasonal high water table exists, stormwater from the development site may be conveyed to a stormwater basin via a system of perforated pipes. These pipes may be made of PVC or corrugated metal and are available with perforations of varying size and spacing. Perforated pipe specifications shall be certified by a professional engineer. A professional engineer shall certify that perforated conveyance piping will not act to intercept the seasonal high water table and convey groundwater to the stormwater basin. All open or perforated stormwater conveyance systems shall be installed with a minimum separation of two feet from the seasonal high water table. New Jersey BMP Manual, available from the Division of Watershed Management, New Jersey Department of Environmental Protection, PO Box 418, Trenton, New Jersey 08625; or online at http://www.njstormwater.org. NJDEP Stormwater Management Facilities Maintenance Manual, available from the Division of Watershed Management, New Jersey Department of Environmental Protection, PO Box 418, Trenton, New Jersey 08625; or online at http://njedl.rutgers.edu/ftp/PDFs/1188.pdf. New Jersey Pinelands Commission, PO Box 7, 15 Springfield Road, New Lisbon, New Jersey 08064; Phone: 609-894-7300; Website: http://www.state.nj.us/pinelands. State Soil Conservation Committee Standards for Soil Erosion and Sediment Control in New Jersey, available from all state soil conservation districts, including Burlington County Soil Conservation District, Tiffany Square, Suite 100, 1289 Route 38, Hainesport, New Jersey 08036; Phone: 609-267-7410; Fax: 609-267-3347; Website: http://bscd.org. Cape Atlantic Conservation District, 6260 Old Harding Highway, Mays Landing, New Jersey 08330; Phone: 609-625-3144; Fax: 609-624-7360; Website: http://www.capeatlantic.org. New Jersey Department of Transportation, PO Box 600, Trenton, New Jersey 08625-0600; Phone: 609-530-3536; Website: http://www.state.nj.us/transportation.